Having survived two-strokes and a heart-attack, I figured I’d better get around to doing the one thing I’ve always wanted to do; write, record and publish a few songs. My first song is about the way people in our lives impact our relationships with the things “They Say”. And don’t worry, you’ll have a chance to buy it below the video! Ha! THIS VIDEO IS THE NEW “REMASTERED” VERSION OF THE SONG! PLEASE CHECK OUT MY NEW FUNKY-BLUES INSTRUMENTAL – MAXSTRUMENTAL 6C, THANK YOU! 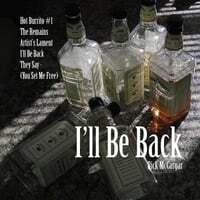 Download “They Say (You Set Me Free) from cdbaby. Download “They Say (You Set Me Free) from iTunes. What a journey this has been! From a prognosis of an early death, to writing, copyrighting, recording and publishing my first song at age fifty-six. But first, a little background. In November of 2004, age forty-seven, I experienced two strokes and a heart attack, and was told I’d be lucky to live three months. I couldn’t read, make new memories, and had poor control of my left hand and arm. To further complicate matters, I’ve spent a lifetime struggling with the problems associated with being manic-depressive (cannot thank supportive family and friends enough). Beyond the obviously more important family related trauma and issues, guitar playing, which had been a life-long passion, was out. Family flew in from around the country to say goodbye, and then I waited….waited some more, took all the meds, did what the doctors suggested, and got my affairs in order. And..continued to wait. Crazy part of the story…I didn’t die. By late 2011, I was still kicking, could read (though still made difficult because of the mania and depression) but still couldn’t play guitar, so I decided to work on playing a single note, then one more with the next finger on the next fret. Working on that for months, without realizing it, I was busy rewiring my brain. I started to record my progress playing guitar, and to watch for problems or signs of another stroke. With time, the videos started to become a bit longer, less amateurish, so I decided to start posting the licks, solos and songs I was relearning, with the hope that they would be of use to beginners, and that it would help me maintain the drive to practice. Fast forward to 2014, and I have 1660 followers on my youtube channel, and over 445,000 views. It seems crazy. I’ll likely never perform live, because I forget all too many pieces after relearning them, but I have them recorded, so it’s progress. Best of all, I’m alive to see my children have children, and get to play with my grandchildren. In February, I made the decision to write a simple song, and do something I’ve always wanted to do…work with Abbey Road Studios in London. Without the funds to actually fly to London and record using their studio, I did the only thing I could, to make it happen; I recorded it using the microphone on my ZOOM Q3HD video camera, and then sent it to Simon Gibson of Abbey Road Online Mastering to have it mastered. Simon was the man charged with remastering the entire Beatles catalog, so I was excited. I know you can’t make a silk-purse out of a sow’s ear, and that at fifty-six, I’m pretty old to be an amateur singer and guitarist, but Mr. Gibson would be the one man who could make the most of the simple recording. Having already built a world-wide semiconductor company and lost everything, hated sky-diving but did it, gone white-water rafting and hang-gliding and learned to race cars, I figured the worst that could come of this new endeavor is that nobody would enjoy my song, but that I would have once more, followed my dream wherever it took me. It truly is the journey, and not the destination. Make sure to die with few regrets, leave no stone unturned… apparently, before your eyes, I’m becoming cliche man. As I own all my successes and my failures, whatever happens here, with this song, is okay with me. It’s a challenge, and an experience about which I’ve dreamed. They can only get better with practice. Most everyone who has ever been in a relationship has had people tell them that the person is not right for them. They Say the person is wrong for you, They Say this, they say that..they meddle with and in your relationship, and it has an affect. So my first song is about life and relationships. It’s brief. Much more so than this post. The song is titled: They Say. Below, you’ll find the video, and following that there is another link to purchase and download an MP3 from cdbaby. But before you go, thank you for taking part in this new phase of my life! I can’t thank you all enough. I wish you the best of luck, and by luck, I mean those things we do to increase opportunities for ourselves! Well, here’s that second, fleeting chance to buy the MP3 for every bit of $0.99 on cdbaby. I sure appreciate all the support the community has given freely over the past two years, thank you! Richard, where do I begin? What an amazing story. I already had great respect for your playing and this blog, and now I am blown away! I will definitely have hubby read this today, and if you don’t mind, I’d like to re-post this to my blog later this week. Congratulations on your new song! Hi Rick! It’s up and running on my site. Thank you for letting me share your post. By the way, I was wondering if your song is available on iTunes. . .
Hi Anita, there is an iTunes link just below the video. Again, thank you for the repost, it is quite an honor, particularly coming from an artist I so admire. Ha, ha. Showing my poor observational skills again. Purchased! Ha, stop, you’re killing me! Thank you Anita! By the way, I’ve been watching your channel for an announcement. When will your new work be released? We were supposed to go back into the studio to finish recording this month, but the usual problem got in the way – finances. 🙂 I feel confident that we’ll be able to reschedule by the end of next month. Well, I’ll keep checking in. Like many, I’m looking forward to picking it up! Thank you Anita! That would be my first repost, so very cool. I realize what an amateur singer I am, but like I wrote, if not now, when? The most I really hope for is that it ends up covered by someone, but even that seems terribly unlikely, so it’s just fun to finally get into it. Again, thank you! Rick McCargar was one of the very first bloggers to visit, and “like” Noted in Nashville. After seeing this fellow musician’s site – Guitar Licks and Tabs, I took a risk, and sent an email to this perfect stranger, asking for technical advice. And he answered. It’s because of Rick that I have a You Tube account, and an outlet for much of my music that was just collecting dust. I am so grateful for his willingness to help nearly two years ago, and so happy to have his continued support in all my musical endeavors. I’m turning off the computer next week for a self-imposed Spring Break. Woe is me. 😉 I look forward to catching up with all of you in two weeks!